We've been asking new morning anchor Dave Chudowsky to share some of his favorite things with you. Today, he made a bizarre treat from his college days. Have you ever had applesauce, milk and maple syrup? Ummm... Now this is definitely a strange food combination from @davechudowsky's college days. 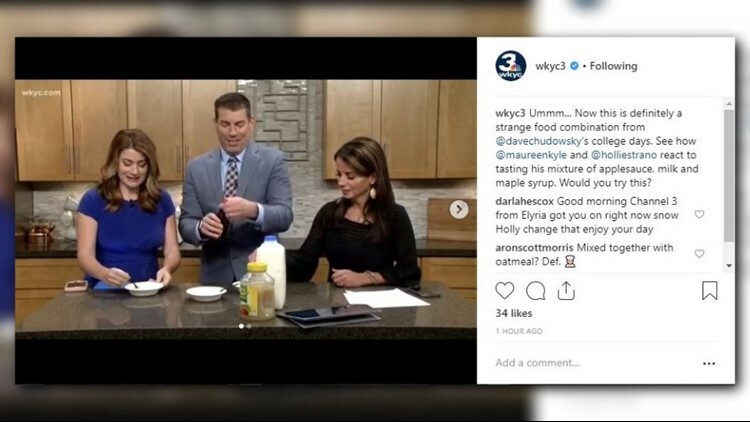 See how @maureenkyle and @holliestrano react to tasting his mixture of applesauce, milk and maple syrup. Would you try this? It's beginning to look a lot like Christmas... already? The Christmas spirit is already alive and well in WKYC studios. Look, we already have a tree up! When do you begin decorating for the holidays?